Take note of the name of the headset you intend to use with NativeAccent. Attach the headset via the computers USB port. Wait for the computer to finish recognizing the headset. Install the headset drivers if applicable. In the Device volume section, click the Advanced button. Note the name at the bottom of the Speaker window. 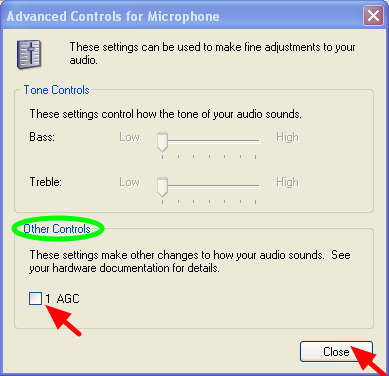 If it is the same as the attached (preferred) headset then the headset has been selected (If this is the case then skip to step 3 – Turn AGC off). Click on Options, then Properties to go to the Properties window. 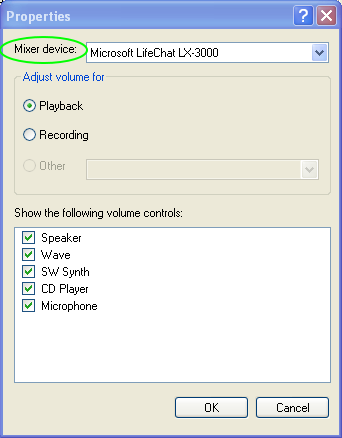 From the Mixer devices dropdown, pick the attached or preferred headset from the list. Back at the Speaker window, note the name of the attached headset at the bottom. In the Speaker window, click on Options and then on Properties. In the Adjust volume for section, pick Recording. 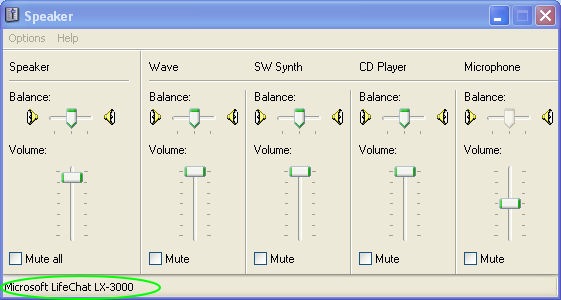 In the Show the following volume controls: section, select Microphone. 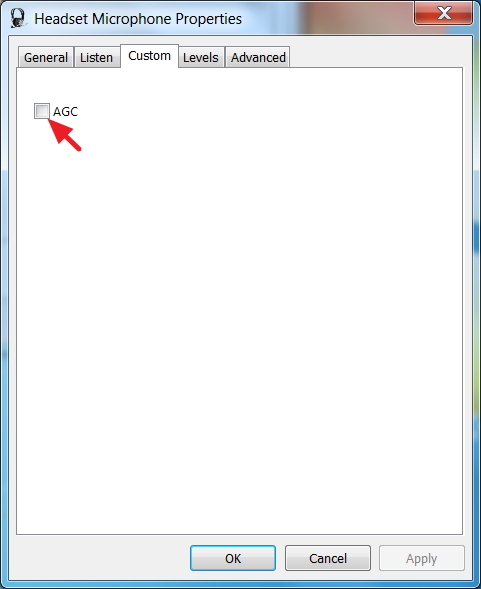 In the window that pops up (Wave In), click on Advanced. In the Other Controls section, unselect the AGC box. 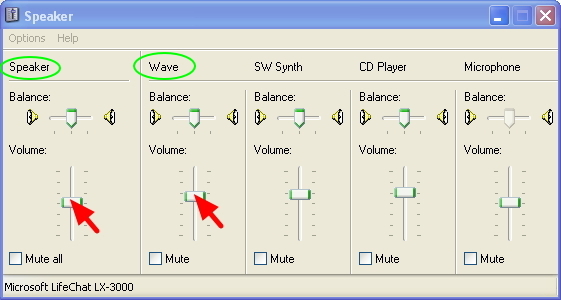 Click on Close to return to the Wave In window. 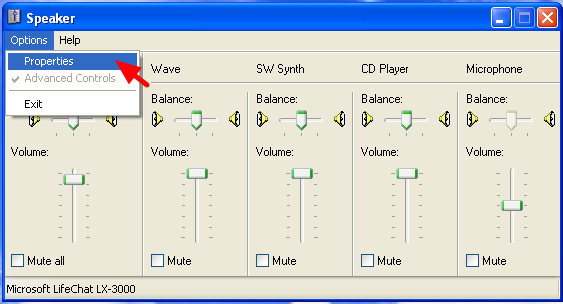 In the Wave In window, slide the microphone volume up and down to adjust the microphone volume. Locate the Wave slider and slide it up. 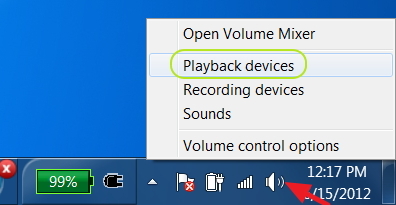 From the system’s tray, right-click on the Volume icon and select Playback devices (Or go to Start -> Control Panel -> Hardware and Sound -> Sound -> Manage audio devices). From the Sound window, click on the attached or preferred headset. 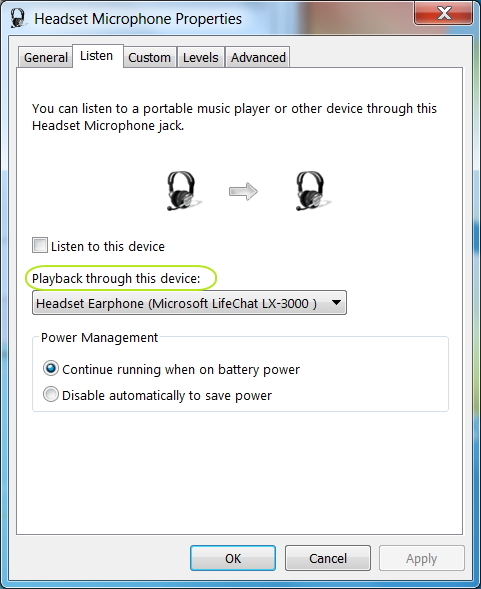 Double-click on the attached or preferred headset’s earphone option. Click on the Headset Earphone slide-bar to adjust to desired level. 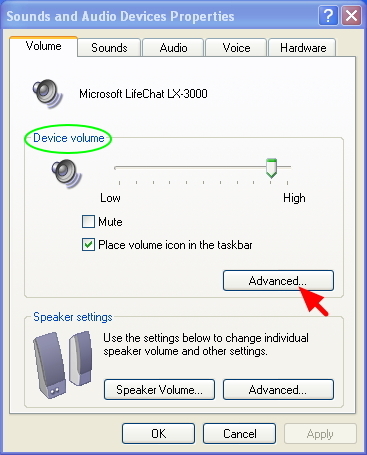 Click on the Headset Microphone slide-bar to adjust to desired level. Click the OK button to accept changes. Back at the Sound window, click on the Recording tab. 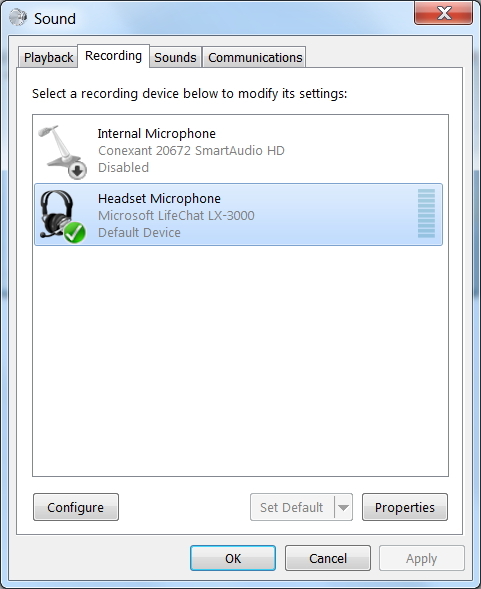 Click on the attached or preferred headset’s Microphone option. 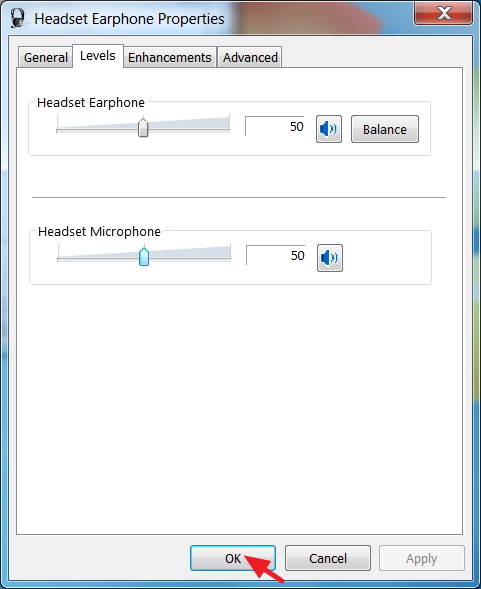 Double-click on the attached or preferred headset’s Microphone option. 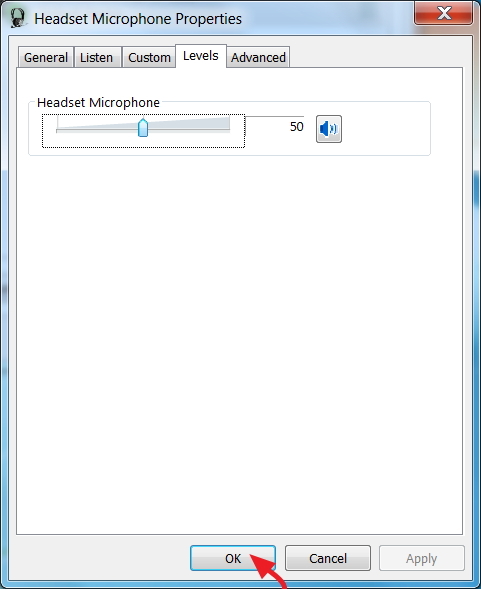 At the Headset Microphone Properties window, click on the Listen tab. 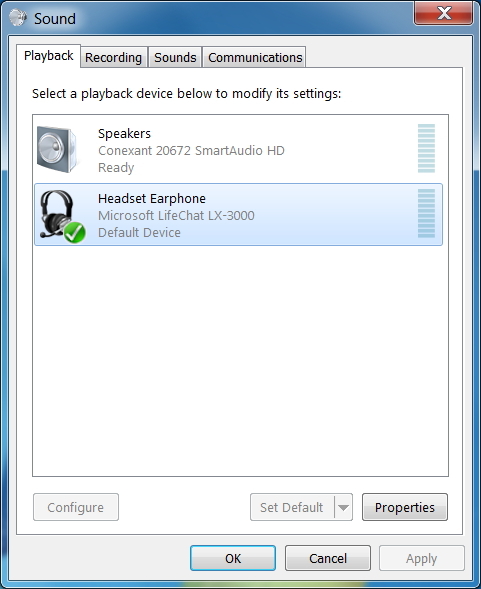 In the Playback through this device dropdown, select the attached or preferred headset. Click on the Levels tab. 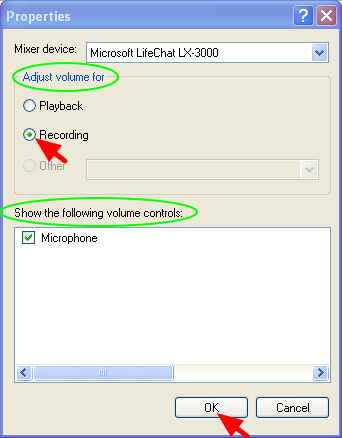 Click on the Headset Microphone slide bar to adjust it to a desired level. Click on the OK button to accept the changes.